The Commission is only too aware, through our casework and conversations with charities, of the financial difficulties that many are facing. Over the past year we’ve seen a number of charities, some high profile, get into financial difficulties – the public interest in these issues is high. And it’s growing. 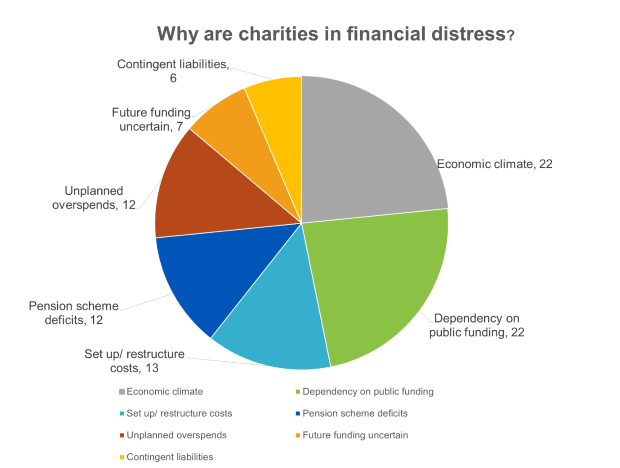 Our role is not to save individual charities but we did want to explore the sector’s resilience to financial distress, and discover if there were any key lessons to help charities manage difficulties better. As such, we undertook a proactive strand of work to look into just these issues. What are the main causes of financial distress? As you can see from the diagram below most of the charities we looked at were affected by changes outside of their control, such as expiry or withdrawal of grants from local and central government agencies, or the impact that the wider economic climate has had on income. This is perhaps not surprising. What made the difference to how the charities got through these difficulties? However, the way trustees dealt with these difficulties was within their control and the results varied. The analysis showed the importance of trustees being alert to risk factors and recognising where changes to funding could have an impact on their sustainability. It brought into focus the importance of trustees managing financial difficulties well and being alert to risks, particularly against a backdrop of changes to funding within the sector. Those trustees that put all the charity’s eggs in one basket, banking on that one golden egg, put themselves at risk with, for some, inevitable consequences. However those that acknowledged they were at risk and explored different options, at an early stage, achieved much better outcomes. Trustees shouldn’t just spot the opportunities of applying for new funding, for example, but also plan for the consequences if they are not successful and what their next steps might be. Some might think this sounds like a negative approach, but I would argue it is quite the opposite. A plan A, B, C and D gives trustees options. The problems arose where these were lacking and trustees didn’t spot the risk indicators and the problems until it was too late. Those charities that reacted sooner, making tough decisions such as reducing spending plans, downsizing, disposing of property assets or seeking alternative revenue sources, were found to be better able to manage themselves out of financial difficulty. Sometimes, that involved collaborating and mergers with others. Some would consider that a merger amounts to failure, but for those we engaged with it was a pragmatic, responsible course of action that was in their best interests to ensure the charity’s objectives could continue for its beneficiaries. There is no easy answer to the difficulties that charities are facing. However, a head in the sand approach is a dangerous one. We recognise that we too have a role to play here to ensure trustees have the skills and information to tackle these problems head on. So over the coming months we’ll be working with a number of charities and technical experts to improve our guidance and speak more about our findings. More on that soon. In the meantime, the reports can be read here. And why not consider the '15 key questions trustees should ask’ at your next Board meeting. Sorry, but your article is a "statement of the bleeding obvious" (with apologies to the team of Mony Python)! Sadly all your article does is to point out the lack of business nous that is severely lacking in the trustees' boards of many charities. If by now people need to understand to plan for changes of finanacial circumstances then when will they ever learn? Banks were caught out because too many had arrogant CEO's who believed that it would never happen to them because they were too good/great. That disease still afflicts too many charities. The last person who believed thus was Charles Stuart (Charles 1st) who literally lost his head on 31st January 1649 in the Palace of Westminster. Completely unhelpful response to a helpful article for all the many trustees who don't know what they are doing and need this kind of guidance. It may be lamentable that people go into trusteeships for charities without fully understanding the business world in which they operate; but many do so because they sincerely believe in a cause and want to help but know that they aren't skilled or experienced in financial or business planning. The CC does a great job helping people to develop the right understanding & skills and provides useful tools to make sure they can operate professionally and sustainably.